​Old Chicago was conceived by designer/builder Robert Brindle after a visit to Knott's Berry Farm in BuenaVista, California. In June of 1973, Robert Brindle brought a watercolor print of his proposed Old Chicago Towne to the Bolingbrook plan commission. He proposed a 345,000 square foot indoor complex that would include outdoor-type amusement rides including a roller coaster, ferris wheel, and log flume, ringed by specialty shops, boutiques, and restaurants. He promised to "put Bolingbrook on the map." For the next year both Bolingbrook and Romeoville vied for the development and tax money it would bring. Eventually, Bolingbrook became the location, but it would be mid-1975 before the mall opened, after many construction delays. ​A pre-opening party for Old Chicago on June 17, 1975 for ten to sixteen thousand invited guests created mammoth traffic jams. It took half an hour to travel south on route 53 from Boughton Road to the mall. The visitors saw Chicago turn-of-the-century style architecture, a million dollars worth of memorabilia, two hundred stores and restaurants, and continuous vaudeville-type entertainment billed as the world's first indoor amusement park. They were welcomed by the park's mascot, Charlie Baffle and enjoyed the first corkscrew roller coaster called "The Chicago Loop" and 31 other rides, including the Rotor, Yo-Yo, Flume, Chicago Cat (Zyklon), Windy City Flyer, plus the International Circus and Vaudeville theatre. ​Two restaurants served Old Chicago: Columbia House owned by Frank Zaucha, owner of the Lemont truck stop and the Old Chicago Biergarten. A contest was held for a young lady to tap dance on top of the dome on opening day. The winner, Michelle Mauthe, was featured in an Old Chicago commercial, filmed that day in high winds by a cameraman inside a helicopter. The first few months after opening the mall hosted 50,000 guests per weekend. To keep visitors coming, couples were married while riding the coaster, Vincent Price was featured when the Haunted House opened, and Miss Teenage Chicago was crowned at Old Chicago. Additionally, a post office opened and letters received an Old Chicago postmark. In November of 1975, the "Comedy King of Air," 56-year old Jimmy Troy fell 20 feet to his death from the trapeze in an aerial accident at the Old Chicago Circus. Only six months after opening, the complex ran into financial troubles due to construction cost overruns. Additionally, the park was hurt by a lack of anchor stores to bring in local repeat shoppers, and the opening of a competing amusement park in the same general region, which resulted in the mall being on the verge of bankruptcy. In 1977 Old Chicago donated space to the Fountaindale Theater Project, the local amateur theater group, to perform plays. In the summer, opening hours were shifted and more features were added to attract more people, including psychic fairs, battle of the drums competition, graduation nights, family nights, antique shows, car and cycle shows, the Auccopolco High Diving Team, and the "Human Torch" who literally set himself on fire. Summer concerts, billed as Star-fest, featured such notable entertainers as: Gary Puckett and the Union Gap, Chuck Berry, Black Oak Arkansas, Willie Aames (from Eight is Enough), Dr. Hook, Commander Cody, Wild Cherry, and the Four Tops. ​In July, the Bolingbrook Jaycees stage their third annual fireworks display at Old Chicago, accompanied by parachuters and midget racers. Also in July, billed under the headlines of "Public Executions at Old Chicago" a desperate public relations gimmick promoted the celebration of Bastille Day at the park with fun shows featuring "the rack", cat-o-nine-tails and other antique torture devices. 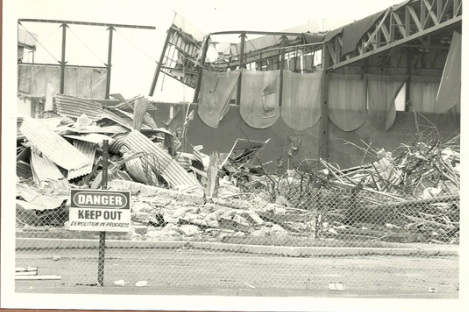 In August, Hollywood movie director Brian DePalma became the first person to try to demolish Old Chicago. While shooting a scene for his film "The Fury." DePalma and his special effects crews sent a part of a ride (the paratrooper) crashing through the window of the Biergarten. Extras in the movie include several Bolingbrook residents who may be seen if you look closely at the two minute sequence that immortalizes Old Chicago in film. In September Deejays John Landecker, Steve King and Bob Sirott hosted part of the Jerry Lewis Muscular Dystrophy telethon at Old Chicago. Some $27,000 was raised at the park alone. In October, Old Chicago hosted the Pepsi Challenge, one of the first locations in the Chicago area and in November, opened The Fun Factory, a multi-level super play area for younger children, with its own separate admission fee and entrance as part of a $6 million park improvement program. The improvement program also included colorful sound baffles hung under the dome to help prevent the deafening, unpleasant noise of outdoor amusement rides operating indoors. New rides including the Screamer and Barnstormer airplane thrill ride plus a laser light show were added. Unfortunately, all this was not enough to keep Old Chicago operating without shortfalls, and by 1978, the mall began closing early on Mondays and Tuesdays. 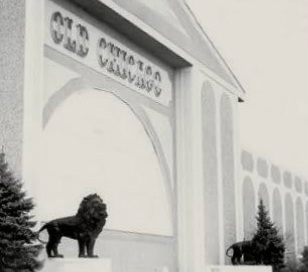 While Old Chicago put Bolingbrook on the map, after numerous setbacks, the park closed on March 17, 1980, the rides were sold, and the last remaining stores left soon afterward - only five years after opening. The famous lions in front of the door were modeled after those at the Art Institute of Chicago. They were sold to Joseph Levy, who owned a car dealership next door to the center. He moved them to his Skokie car dealership and painted them purple and white for Northwestern University's colors. They were later sold to Terry Upton of McHenry, Illinois. Plans to turn the mall into a factory outlet mall, a motion picture/TV production soundstage, a gambling casino, an international trade center, and a future spot for the 1992 World's Fair, all came to naught. In February the Village hosted a "media event" to persuade the world that demolition of Old Chicago would be a fresh start. ​By March, piles of rubble grew along Rt. 53 just south of I-55 as Old Chicago’s walls tumbled and in April, the dome quietly sank into the sunset with absolutely no fanfare. ​By the end of the month, not a trace of the former amusement park remains - only memories. Arena Auto Auction now sits on the site. As an aside, the original property was farmed by the Earl Meisinger family. He remembers being a three year old riding his tricycle across Rt. 53, a feat not possible today. Excerpted from . . . .Bolingbrook Keeps Making History, Vol. 3, compiled by James D. Bingle, Savoring the History of Bolingbrook - A Keepsake Cookbook presented by the Bolingbrook Historic Preservation Commission, the Old Chicago Trivia courtesy of Village Clerk Carol Penning, Old Chicago Timeline from an article in The Met newspaper published April 17, 1986, and the Bolingbrook, Illinois 35th Anniversary Calendar. Pictures courtesy of the Historic Preservation Commission archives. If you are interested in purchasing the three-volume Bolingbrook history compilations or our cookbook which contains residents' memories in addition to Bolingbrook history, a free copy of the entire timeline, or perhaps have something to donate to our artifact collection, please contact the Commission using the "Contact Us" form on this site. 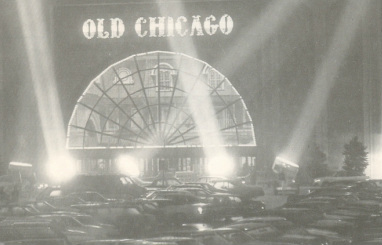 We hope you enjoyed this look at the past and that it brings back memories to those of you who visited Old Chicago.